If you wanted a few of Kaylee’s world-famous pastries, you used to have to be one of the first people at the local Farmer’s Market. 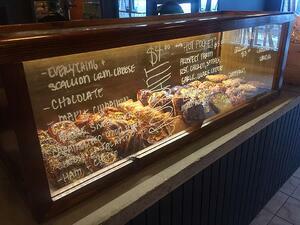 Now, you can purchase all your favorite pastries and breakfast sandwiches at Crumb Bar on Main Street. But, get there early as Kaylee’s sugary treats still sell out frequently. Something unusual is happening in Littleton. While the state of New Hampshire as a whole is getting older, the town of Littleton is getting younger. No, the townspeople aren’t drinking from the Fountain of Youth. Young people are discovering how incredible the Littleton area is and are moving in droves. One such young couple was Kaylee (pictured left) and Chris. Chris had friends from the White Mountains, and after many years living in Nashville, he needed a change. After a short visit to Littleton, he fell in love and purchased two apartment buildings. Chris met Kaylee while working for a catering company for music festivals and concerts. They soon started dating, and the rest was history. After moving to Littleton, Kaylee and Chris quickly realized there was opportunity for another bakery in the area. 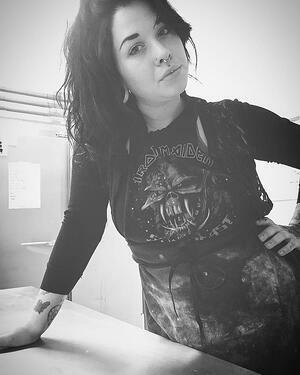 Crumb Bum Bakery began in 2017 at the local farmer's markets with custom cake orders for events and weddings, and wholesale accounts. As the demand grew, it was time to start a brick and mortar location (pictured right) for all to enjoy. Chris came up with the original name – Crumb Bum Bakery. 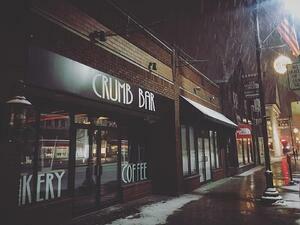 As Kaylee says, “we wanted a name that would say super delicious without being at all fancy or pretentious.” The bakery originally began in one of Chris’s apartment buildings in a renovated commercial kitchen, but as the bakery quickly grew in popularity, it moved to 97 Main Street where it changed its name to Crumb Bar. “We didn’t want to limit ourselves only to be referred to as a bakery,” said Kaylee, “we want to be so much more than that! We’re hoping to offer composed desserts and tasty adult beverages in the future.” Chris is an excellent bartender, and you can find him at Cold Mountain Cafe a couple of nights a week mixing up some delightful cocktails. “I’ve lived in New York City and Nashville. More so than another place I’ve lived, I really understand the ‘Buy Local, Support Local’ way of life we have in Littleton. I’ve never felt before that I was actually supporting my community by shopping or buying my meat and vegetables directly from the person who raised and grew them. It’s easy to feel like you don’t make a difference in a big city,” says Kaylee. The small town of Littleton is indeed a hidden gem for many. With the influx of young people looking to move away from big city living, Littleton offers a wonderful quality of life. You’ll still find incredible gourmet food, like the pastries and desserts at Crumb Bar, and the music and art scene you’d find in larger cities, but you’ll also find a sense of community where everyone knows your name and greets you with a smile. 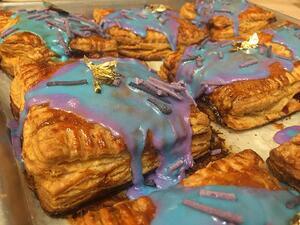 Next time you’re wandering down Main Street, stop by Crumb Bar and enjoy one of Kaylee’s delicious pastries. From colorful berry-filled pop tarts to duck fat buttermilk biscuit breakfast sandwiches, you’ll leave full and maybe in a bit of a sugar coma.